What are the pros and cons of being a married priest? I’ll be writing on various aspects of this question over the next few days. Firstly, we need to get some huge red herrings out of the way. On the face of it, this seems obvious, but just because a man is married does not mean that he has a successful marriage. Do we really think the simple fact that a man is married makes him a wonderful husband, a sympathetic person, a fantastic Dad, a terrific marriage counselor? Of course not. Marriage is not the magic bullet that makes everyone live happily ever after and instantly makes all men wonderfully sympathetic pastors. Guess what? Married clergy run off with other women (and men). They neglect their wives and kids. They are just as mystified as any other man about the strangeness of love and the demand for self sacrifice. Married priests are also a work in progress. I’m not saying that all married priests are skunks. I’m just saying that marriage is not an instant fix. The sheer fact of a man being married doesn’t make him super-Dad and wonder husband. Nor does it mean that he is a wonderfully sympathetic marriage guidance counselor. The second howler people repeat time and again is that having a wife will keep the man down to earth and a clergy wife will be a wonderful asset to the parish. Yes of course that can be the case, and there’s no denying that many clergy wives are wonderful people who do keep their husbands feet on the ground, help quietly in the parish and are an absolute benefit to his ministry. It is certainly the case that “a good woman” is exactly what a man needs, and that good woman can be a good woman to the parish too. But it’s not automatic. Clergy wives are also human. They run off with other men (and women) They put careers first. They can nag and be bossy. Worst of all are the situations where the clergy wife wears the pants in the family. Bad clergy wives can be terrible gossips, busybodies and complete terrors. Read Trollope and meet Mrs Proudie. Third one: “It is so wonderful to see Father’s children at Mass!” Sure. It’s an inspiration to see well-scrubbed clergy kids going to church. It’s also a pretty huge disappointment and is counter productive when the clergy kids end up being human, drop out, end up on drugs or simply scandalize everyone in the parish. You see, we often talk about the pressures of marriage on the priest. No one talks about the pressures on the wife and kids. Pressure not only to give up their Dad for more hours a week, never having weekends or long vacations (who is going to cover Sunday Mass?) There is also pressure to be perfect moms and perfect kids. Their Dad has to be Jesus for goodness sake! Who does that make them? Paragons of perfection all. 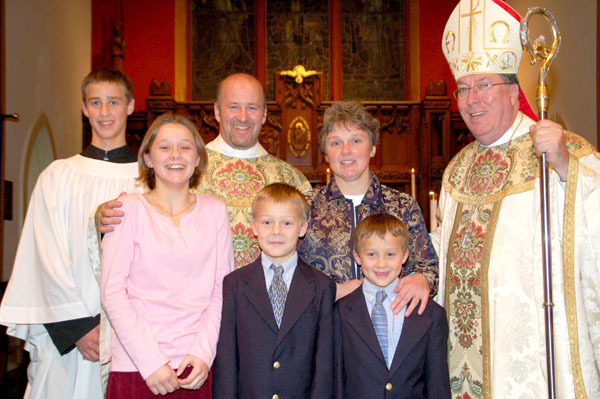 Members of the Holy Family on earth…It’s a tough act, and no wonder so many clergy marriages fail and clergy kids become notorious oat sowers. Pointing out these problems is not to uphold celibacy as the only way forward. Let me tell you, when clergy marriages and families are good they are very good for the church.